If those pictures in my last post inspired you to install crown molding and trim in your own home, then my husband Dave (who has done his share of it) offers some advice. As I’ve mentioned before, we built our home four years ago and were faced with a series of bare white rooms. No crown molding, no trim around the windows. So Dave read up on how to install them, bought the equipment, and set to work (you can see some of the results in earlier posts on the topic; see links below). Because we’ve had so much interest in the topic of crown molding from people visiting this site, I asked Dave to share his advice for anyone who wants to attempt it themselves. He insists that it isn’t as difficult as you think! Paint your crown molding instead of staining it. It’s easier to cover up your mistakes. Caulk can cover up a multitude of sins. There is little room for error when working with natural wood. A power compound miter saw and an air compressor and nailer are indispensable. When cutting the crown, I tried several times cutting inside corners and outside corners with one-foot long pieces until I got it right. Once I did I kept the small one-foot long pieces as reference. I followed the old adage, “measure twice, cut once.” I’d measure twice, but also refer to my samples to make sure I was going to cut the pieces the right way. If it’s your first time, don’t expect to cut everything perfectly. I didn’t and had to go back to Lowe’s to purchase more molding to finish the job. Working with eight-foot pieces is easier, but of course requires more joints, which means more chance for error and not the seamless look. I started cutting by holding the molding on the bottom and against the back fence of the saw (in position). I then found this site (www.installcrown.com) that described how to set your compound miter saw that will allow you to set the saw angles to cut “on the flat.” This was helpful to me. Thank you, thank you, thank you! This post is fabulous and beyond helpful!! I used to think crown molding was a luxury. After seeing your blog, I’ve come to believe it is a necessity. What a difference it makes! Thanks for all the good ideas you’re putting out there. 1. On long runs you can hold pieces up and mark them instead of using your tape. This eliminates the need to “measure twice”. 2. Figure out the distance from the ceiling to where the bottom of the crown hits the wall and snap a base line before installing the crown. This helps minimize any waves or discrepancies in the ceiling. To all – Feel free to check out our podcasts for home improvement tips. If you have a question we are there to help. We may even use your question in a future episode. Oh…I’ve been living in Bangor too long! 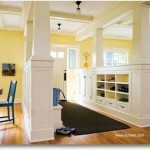 If you’re into crown molding you should check out Trim-stix.com. Some guy made a video about a tool that helps with it! Did you use wood or mdf for your moldings? They are gorgeous! Do you have any more pictures that show the trim and moldings in the first room? I have contractors coming tomorrow and would like to try to replicate that. Here are some recent interesting crown projects we’ve completed if anyone wants to look?